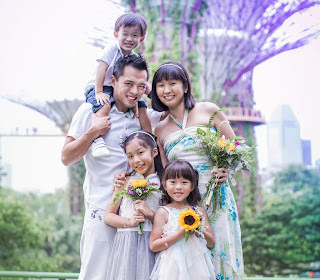 When we moved back from Scandinavia a few years ago, the one big difference that struck me was how easily my kids would fall sick here in Singapore. The dense population, the outbreak of diseases in school, the easily-spread germs, the air pollution, the haze - all of these accounted for how common it was for my kids to come down with an illness or two. When this happened and they in turn spread the virus to each other, you bet it gave me a bad headache. Last year was one of the worst. Not only did we have to battle with hand foot mouth disease, measles, coughs, fevers, stuffy noses and sore throats, we also went through a rough patch when the baby came down with pneumonia not once, but twice. Yes, twice in a year, which isn't very common for an infant. While the first might have been measles-induced, the second was likely due to the house moving and breathing in all the air particles amidst the packing, renovating, shifting and unpacking. After we recovered from that, I set my mind on one thing - to have a cleaner, safer home for the kids in the hope of keeping them in good health. So, one of the first steps was to install air purifiers in the new house and we did that with the help of Purlife, a purification company that is based in Singapore and specialises in indoor air quality. 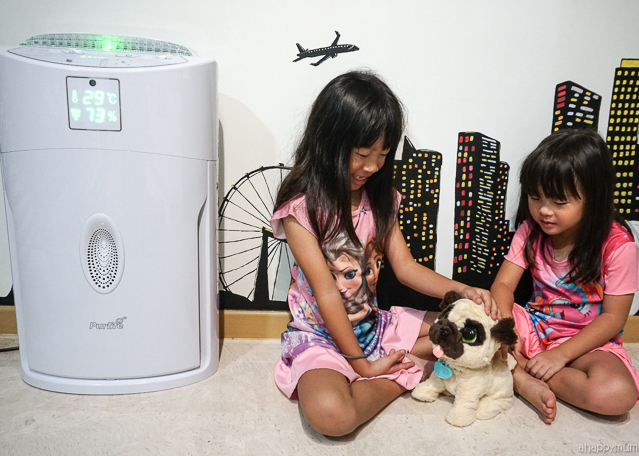 In this post, I will be sharing with you our review of Airclear 50, an indoor air purifier from Purlife, and three lucky readers will also get to win one set (each worth $499) for their homes. When Purlife first mentioned that they would be coming over to 'install' the purifiers, I was half wondering if it was going to be a complicated and time-consuming process. It turned out that what they needed to do was to first check the air quality using an air quality meter, record the readings, look for a good spot to place the air purifier - which measures 672mm (H) x 402mm (W) x 243mm (D) - plug it in and then let it do its job. Yup, that's it, it was totally hassle-free and took a matter of minutes to complete. Depending on the size and layout of your house, you will require more than one purifier to keep the air quality of the entire house in check. Usually, one room will require one purifier but if you have a huge room, it might require two. For me, I chose to have one each in the living room, master bedroom and the girls' room. The boy's room, which also doubles up as the playroom and storeroom, felt a little too cramped so we did not choose to install one here. In any case, we spend minimal time in this room as compared to the rest. So if you have a limited budget or don't intend to purchase one for every room, do prioritise on which areas are in more dire need of cleaner air. These will usually be the spots that you and your kids spend the most time in when you are at home. The Airclear 50 is equipped with a 3M™ HEPA Filter which has a pollutant removal rate of up to 99.97%. This ensures that it has an extremely fine filtration and traps tiny particles down to 0.3 microns in size. It cleans the air efficiently within 15 minutes and ensures that the air quality readings are well within the recommended levels. It works with a noise level as low as 26.5db and features a smart sensor and auto speed mode function to work based on the air quality. Personally, I find that while the noise level is negligible in the day, it gets too loud at night for the kids if left in the 'Auto' mode. So, we much prefer to leave it on at just the minimum strength of (1 or 2 bars). There are readings on the front to indicate the current temperate and moisture level. In addition, the purifier also gives off a backlight which can vary from red, orange to green. Red symbolises that air quality needs to be improved, orange means moderate while green says that the air quality is now at the healthy level. Note that these are just indicative and slight changes in weather or even people passing through might cause the light to changes its colour, so don't get too worried about it. What I appreciate is that while it might be able to function as a night light, you have the option of switching off the backlight simply by pressing a button so that the room remains dim even when the purifer is turned on. There is also a timer function (1h, 2h, 3h or 4h) for you to make use of should you wish for the purifier to be turned off after some time. 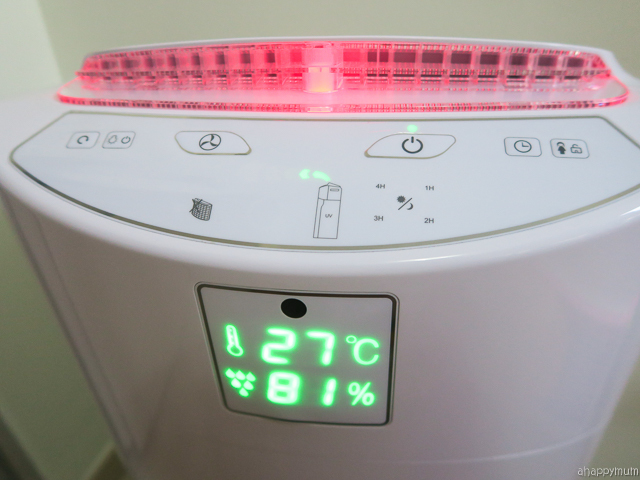 According to Purlife, the Airclear 50 is also supposedly be easy on the pockets and according to a 8-hr daily usage calculation based on Singapore Power’s Home Electricity Audit, using one of these purifiers will cost you less than $3 a month. Of course, the more you choose to install, the higher the charges will be so it's up to you to decide what is worthwhile for your family. With three kids in the house, one being an inquisitive toddler who likes to lay his hands on everything he sees, I have to make sure that our home is a childproof as possible. The Airclear 50 has been designed to be as child-friendly as possible and that is something of relief to me. Weighing 8kg and with a sturdy base, it does not topple over easily even if the kids accidentally knock into it. Before you think that the purifier is not portable and hard to move, it's really not. The sides have handholes which make it easy to grip so you can shift the purifier around whenever you are cleaning the house or when guests are coming over. Wires lying on the floor are a safety hazard for my kids and other than a risk of electrical shock, there is a very high chance that they would trip and fall, especially the toddler who doesn't watch where he goes nowadays. The Airclear 50 comes with a wire holder at the back so you can easily wind the excess wire, tuck it in neatly and keep it out of sight. Which kid doesn't like to press buttons? My toddler, who loves to play with remote controls, was elated to see that the height of the purifier suited him so well that he could easily press every single button whenever he liked. Thus, it was a good thing to know that there is a child lock function and once you press this button, the child will not be able to change the settings. That is, until one day he realises how to turn off the child lock setting. Well, hopefully he won't be so much in love with buttons by then! In terms of air quality, which needs to measured with a meter, it can be very hard to determine the exact benefits brought about by the use of the purifiers. 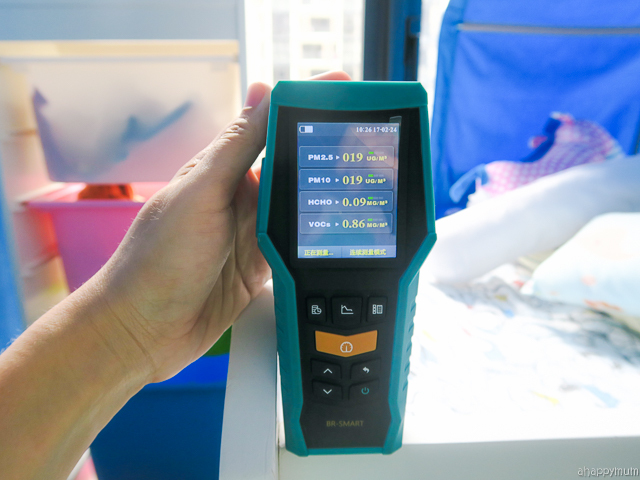 In order to get comparison statistics, what Purlife did was to check and measure the air quality before the purifiers were installed and then do a second round one month after use. Below are the reports for each of the rooms. Of all the readings, I'm most concerned about PM2.5 - particulate matter smaller than 2.5 micrometres in size - since it can be easily inhaled into our lungs and go into the respiratory system, which can in turn lead to respiratory and cardiovascular illnesses. Children are at increased risk because of their developing lungs, high activity levels and are thus more likely to have asthma or acute respiratory diseases. We have a perennial issue with the smoke haze due to forest fires in the region from time to time. Do you remember how severe it was in 2013 when PSI levels skyrocketed and hit over 400? I recalled how the whole city was shrouded in smoke and even when I had closed all our doors and windows, it didn't mean that we were not getting exposure and I felt like we were still breathing in unhealthy air all the time. While I'm keeping my fingers crossed that such serious cases will not recur, the fact that our home is now equipped with good quality air purifiers keeps me feeling more prepared and assured. 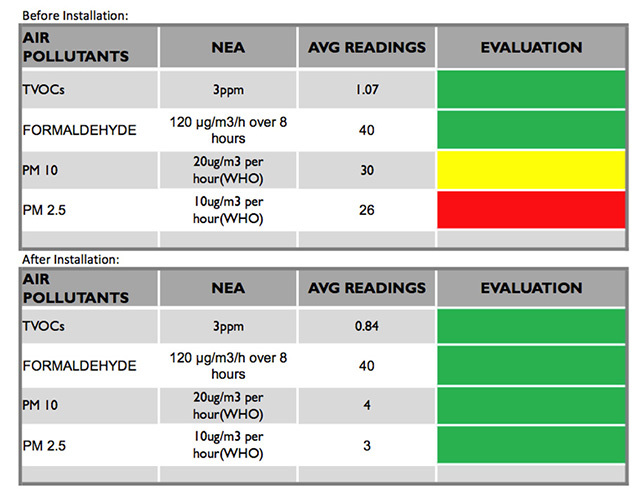 As you can see from the readings, the air quality in every room of the house, including the PM2.5 level, is now kept within healthy levels as recommended by NEA. So after three months of using the purifiers, I decided to open up the filter just to take a look. By the way, it is recommended that you change the filter every year. When you purchase the Airclear 50, Purlife covers you for the replacement filter after the first year and includes an air quality check. Subsequently, a new filter and air quality check costs $89 per annum. When it is time for a filter change, the button will light up so that you are notified immediately. 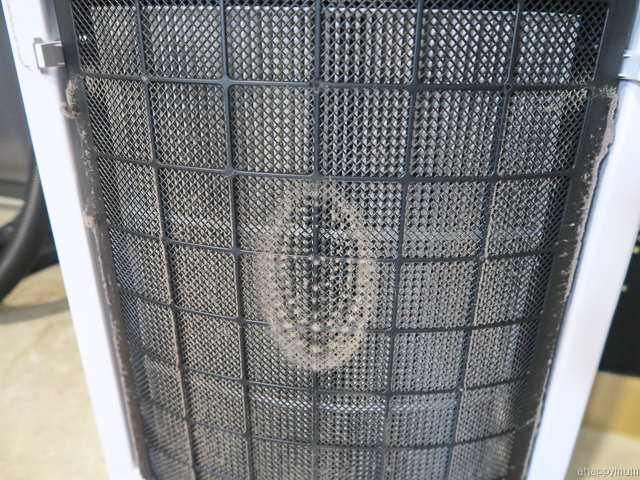 So, back to our filter, can you believe how much dust and dirt was trapped inside in just a short period of time? Yup, just because you don't see it doesn't mean that it isn't there. I was surprised to see how dirty it was and it made me shudder to think of how all these particles could have easily gotten into our bodies, my kids' bodies. Ewww. Anyway, to clean the filter, all you need to do is use a dry wipe to get rid of the dust. Besides the Airclear 50, you can also use the Driveclear50 in the car or for very tight spaces in the house too. It helps to eliminate smoke and pet odours and gets rid of 90% of PM2.5 particles. Measuring 200 x 186 x 75 mm and weighing 0.7kg, it is compact and fits easily in most spaces. For me, you know what's the best sign that our health has improved this year? Well, check this out, we haven't made a single trip to the clinic! Yup, that is something worth celebrating after all the ordeals we went through last year. Not just that, we also haven't had the need to take any medication, not even for any coughs, colds or fevers. Yup, not me, not the primary schooler, not the preschooler, not even the toddler. Although I can't say that all of the credit goes to the air purifiers, having cleaner, purer air at home is definitely one of the reasons why we are now leading a healthier life. Good news, again! I have an awesome giveaway for you and yes, I'm giving away not one, but THREE sets of indoor air purifiers (Airclear 50) from Purlife! To participate in the giveaway, leave a comment in this post with your name, email address and tell me why you wish to win. Indicate on the Rafflecopter widget that you have commented and to increase your chances of winning, you can choose to carry out the rest of the options. This giveaway ends on 8 June 2359hrs and is in no way sponsored, endorsed or administered by, or associated with, Facebook or Instagram. The winner will be picked randomly, announced here and contacted via email. Best of luck, people! 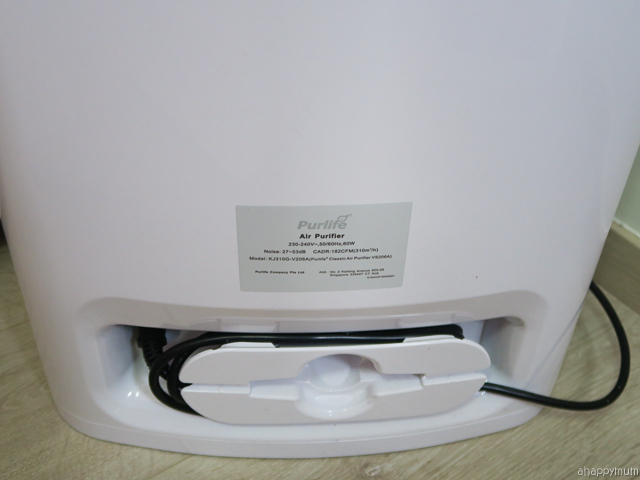 Disclosure: This is a sponsored review and A Happy Home has been equipped with air purifiers from Purlife for the purpose of writing this post. All opinions are our own. I like the driveclear 50. Having 2 dogs and a hammie at home, my folks can rest assure that everyone in the household has clean air for healthier individuals. Hope to win a set of Airclear50 from ourlife for my 13 mth baby who has sensitive airway, this will really comes in very useful for us to ensure we have clean air at home. 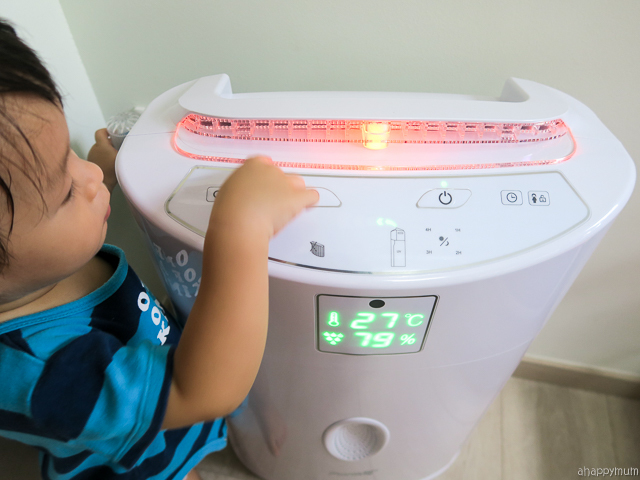 Hi, purifier is a great thing to have at home especially when you have kids. I have 3 beautiful girls. My 2nd girl have ezcema, same as me. We are moving to our new house soon, so I hope to win Airclear 50 for my girls to use in their room. Hope to win his for my girl who has sensitive airway as she is born prematurely. She easily has blocked nose when she sleeps. Hope this will ease her discomfort. The purifier would be ideal for my 2 girls with sensitive airway. We've been using Philips air purifier but it recently died on me :( hope to be able to win this! Hope to win a set of the purifier as my 4yo have "asthma" according to doctor because of his frequent recurring bronchitis and his eczema. Hope this will help to improve the air quality and reduce the dust particles and allergens in the air. I stay within the CBD and at 40 plus storey. With the intensive construction going on, the quality of the air is not great. 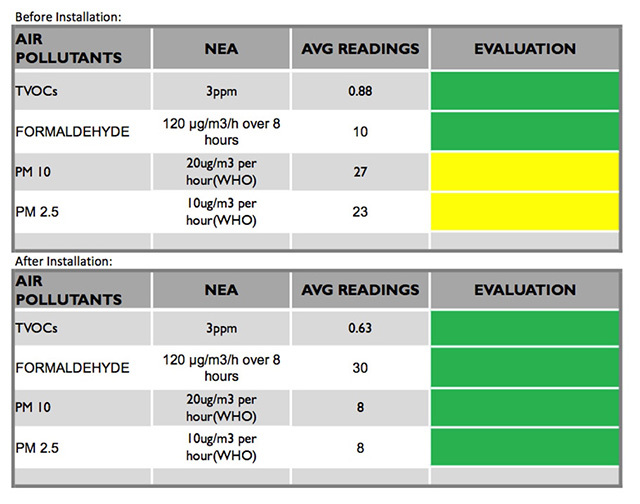 So I'm hoping with an air purifier, the quality of the air my kids breathe will be improved. I would like to win for my boy who has sensitive airway. Hope this will improve his condition. Will like to win one as the whole family has sensitive airway. Hope this can help us and so the kids can see doctor less often. Would love to win this for my boys who have sinus and are more sensitive when the haze comes. My kiddos walls are mouldy and Aircon is emitting musty smell. This AirClear50 will help my kiddos to breathe easy while I find time to repaint and service the AC unit. My son has bronchitis. My purifier at home is spoil. Hence I hope to win this for him and provide him a clean air and environment at home again. We stay next to a big park that spans at least 2 mrt stops. the amount of dust flying in is incredible, as compared to other places that we have stayed (ie next to a major traffic junction etc). i guess that's because of how the wind blows in the dust from around the area. hope to improve air quality at home! I would like to win a set of the air purifier because my 2 daughters are prone to cough and sensitive nose. I'm sure the air purifier will help them to breathe and sleep better. Hope to win to improve kids'sinus condition through better air quality at home using Purifier. My Mother-in-law's nose are not "friends" with Dust and Airborne Particles in the Air. She had an operation done for her eye recently. Dust and allergens are present in the air. Its not just uncomfortable and sensitive for the nose/ throat but even the eyes as well. It causes her eyes to tear and tear and eyes gets red and sensitive. Winning the AirClear 50 Air Purifier means Clean and Dust/ Allergens Free Air for my Mother-in-law. Hoping to #WIN this AirClear 50 Air Purifier for My Wonderful Mother-In-Law as a Present for Her. Thank You A Happy Mum and PurLife for this Generous and #Awesome Giveaway!! My Husband and children have sensitive airway and allergic to dust mites. Hope to win this for them. Hope to win this to be placed in my premature baby who is coming home next week. Dust & unclean air is not good for him, who has not recovered from his chronic lung disease. Hope to win this to help him stay in a clean environment. My kid has sensitive nose and is allegic to dust and dirt. Hope to win this and improve the air quality such as she will not fall sick easily! Tks for the awesome giveaway ! 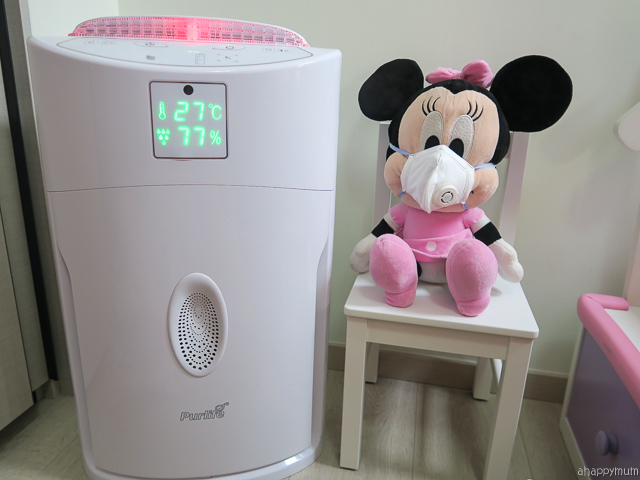 I would like to win a set of the air purifier from Purlife for both my children who has sensitive nose and ezcema. Thank you. My son had allergic rhinitis which made him do not have good sleep. Also to improve his overall health and less trips to see doctor. Would love to win coz both my girl and hubby have sensitive airway and nose respectively. My girl need to take medication if her sympton arises and there is once she was diagnosed with bronchittis. And due to sensitive airway she easily prone to flu n cough. Really hope to be one of the lucky winners for Airclear 50. Both my husband and I have sensitive nose. Resulting in allergic rhinitis for my two sons. Sent many western and TCM medical practitioners, taken lots of medication. Hope to win the air purifier to give the best to my lovely family. I hope to win this for my mum as she as breathing problems and is very sensitive to dust. She hasn't been sleeping well due to these issues even after doing a nasal surgery so i hope this will help improve her condition, especially during her recovery period. Hello happymum I moved to Singapore from India last Feb since then my 2 years daughter fall sick 3 times. last week she is having high fever and phylum in her lungs doctor said, after reading your post I thought due to air pollution she is falling sick,hope I may win the giveaway. My 2nd kid is on oral medication which lowers her immune system due to her medical condition and injections and few months ago she had pnemonia and had to be on few months of antibotics. The other 2 kids and myself have eczema and sinus problems and is on nose spray and anti allergy medications. This would be a great solution to prevent all the visits to the doctor and with bagfuls of medications and antibotics. Stressful to the kids and parents. Want to prove to my husband that air purifier really works as he always had doubts of its effectiveness. Been asking to have air purifier, with this great opportunity, able to solve all my problems. My house's environment have been very humid, and very easy to get dust, like the environment can be quite bad as our home is not have any air ventilate so quite stuffy oftenly! So I really hope to win this airclear50 that would change my family life as we have sensitive nose so we hope this airclear50 would help ventilate and clean our air! My boy has got sensitive airway and is very sensitive to dust. We do have a purifier unit in his room so i hope to win ano unit for the living room aka his play area as well. It would be great if we won the indoor air purifier, we've got two very active kids outdoor kids and providing them with clean air when it's time to rest at home would be so awesome! My two very young kids are being cared for my mother-in-Law at her home as we are on long waiting list for childcare in punggol. As My father-in-Law is a smoker, we are concerned about the air quality at their home. Although, he mentioned that he does not smoke when the kids are around, we are worried about the effects of secondhand smoke on the kids. My younger one is already having wheezing and coughing very often.The best way to keep safe from secondhand smoke is to avoid it altogether but as that isn’t an option for us now, using an air purifier is a smart way to help reduce the harmful chemicals in the air and to help keep my little ones safe. Thus, I hope to win this Airclear50 to have a peace of mind and rest our fears. Keeping my fingers cross for my little angel. She is 4 & suffers from Eczema & Asthma. As a mom, it really troubles seeing her either on medication or coughing through out the night. My hubby always have the dry skin & sneezing problem but it seems to one step ahead in my little girl. Hope to be bless & finally find something which can reduce the allergen level at my home & ease her & my hubby's trouble . Thanks for hosting an awesome giveaway. My son and I are sensitive to dust and the purifier will be great for us to ensure good air quality in the house. Hope to win as my son sleeps in the same room as us and he has a sensitive nose like his dad and grandmother. The air purifier will be useful for him. I stay in Punggol, a new estate with many ongoing housing projects being constructed at the same time. Due to the ongoing construction, the air has a lot of pollutants. It is also very dusty. I am allergic to dust. I notice my little girl sniffing at times too. 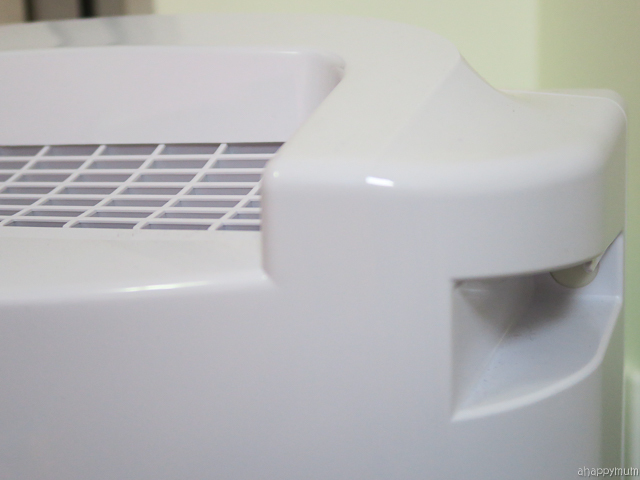 This high quality air purifier with high efficacy seems to be the solution to our problem. There is also the additional benefits of Purlife's energy savings feature and child friendly feature. I don't have to worry about higher utility bills and have the peace of mind that my girl can play anywhere she wants without the worry of the air purifier toppling over. I would love to win this for my children. They are sensitive to dust and have sinus. When the air is dusty due to haze, they will have itchy rashes. It is great to have an air purifier to make our home air clean and I will feel safe with happy children. Thank you for sharing the information and details of the air purifier and the awesome giveaway! My family health is more important than anything so it's really essential for everyone to have this in their home. hopping to win 1 set of Purlife that will enable a good night sleep in the air con room and bye bye sensitive nose. Thank you for sharing about the air purifier. :) Would love to win a set of Airclear 50 for our new house! My daughter has sensitive airways so this would be good for her. Having 2 young children and an asthmatic history self, it is a great concern to me when the hazy days strike. Really hope to win it for the family! My child and I have really sensitive nose and easily get allergic to dust. Would really love to win a purifier for his room to ease his pain and make it a nice environment for him to sleep in. We stay near the sembawang shipyard and the dust tend to make our house very dusty. As my 2 kids have very sensitive airway. They often woke up with flu and swollen eyes and required long term steroid spray every night. Hope to win 1 set of Purlife and do away with the medication and allow them to have clean air in their room. Hope to win this for a better air quality for my child. I would like to win a set for my home sweet home especially for the good sake of my two princesses. I have sensitive nose and hope to win this = have a cleaner & healthier air. Thanks for this recommendation that we can keep our home and family Well from impurities as much as possible! I would love to win it because it would help my preemie baby with his bad breathing. Hope to win the airclear 50 for my family so to have a better air quality as my hub have eczema and the kids have blocked nose every morning. AirClean 50 to improved our health! I need an air purifier at home because I want clean purified air for all my loved ones especially my Mom! My beloved mom is getting old and her immune systems are not as strong as they used to be. By keeping our home air quality at a healthy range. this will definitely keep a lot of health problems away; especially breathing, respiratory tract and lung related ailments. I hope to keep them far far away! I am a mom of 2 young girls between ages 5 to 9 and they are always going to clinic nearly every 1-2 weeks attributed to the bad air which weakens their immunity.I hope to try out the Airclear 50 to alleviate the kids' health. I would like to win it because my child has a chronic cough induced by dust particles. I hope to win the Airclear 50 from Purlife because my HDB Unit is on Low floor & encounter it's fair share of dust. My block is at northern tip of Singapore near Senoko, Sembawang Shipyard, & there's a lot of HDB new BTO flat construction & new Canberra MRT near our area here hence there's lots of dust. My previous Shipping company I used to work for had very bad air conditioning & poor air quality that led to me developing prolonged cough. Since then I always recover from flu severe cough only after several weeks ! I hope this Air Purifier can purify my home air quality & give me better lungs ! Having 2 dogs, an autistic child who have sinus issue and my husband too makes me wish to have this Airclear 50 from Purlife. Clean fresh air means we will be healthier abd have better concentration to do things and play in the house. I wish to win the airclear 50 as I always have sensitive nose and having a purifier helps to clear the dust impurities and my family can have better air quality. I wish to win the airclear 50 because my son has sensitive airway issue since young. Hope to be able to enjoy cleaner air condition at home. I would love to own 1 of this as my daughter inherited my sensitive nose (sob sob) & once got bronchitis. Hope it will help her to have a better and healthier air. I hope to win the air purifier cause lately our family have been coughing every two months or so & the cough for my husband & myself will last for a good 3 weeks. It could be the air that we breathe coz every other things in the house are dusted & cleaned. My kids have sentitive airways and easily get sick when the haze arrives or inhale dusty particles from construction site or activities that produce pollutants. Hope to win the aor purifier so that it will aids in cleansing the air,allowing my kids to inhale fresh clean air for healthy development. Hope to win this for better air quality! Thank you for thr giveaway! Prevention is better than cure. Contaminants and allergens in the air are unavoidable when we breathe. These "airborne assassins" are everywhere and waiting for an opportunity to strike. While we can wear a mask outdoor, I want to come home carefree and be assured that my family can breathe safely and freely. Hope to win this Air Purifier for my son who has asthma. With this air purifier, it will helps to clean the air in our room so that he can breath fresh air. I just want clean air for my family and me. My girls and I have sensitive nose and so dust is an issue for us. I wish to win because I always get sick quite easily and I hope to be able to breathe in higher quality air and to have a cleaner and safer home for my family. I would love to win for my new house, my husband and myself. We both are allegy to dust and hope Airclear 50 can help us to breathe cleaner air and sleep better. As we are also planning for a child, hope this will come handy in near future too ! Hope to win this to provide clean fresh air for my newborn baby and for my elderly parents who are helping me to look after my baby! Thank you for the giveaway! I have a bad sleeping problem due to dusty environment. I try clean up whole bed room but it is still the same. I make me block nose during sleep and sometime snore badly. My husband can't stand my snore and he can't sleep well too. I wish this Purifier can really help me out. Thanks for sharing this good thing to me. My18 month year old toddler is a light sleeper and a regular victim of flu and cough . By owning a Airclear 50, we are confident and trust that it will be able to work its magic in pin-drop whizz and bring out a healthier and cleaner environment to everyone in the family.Happy baby, happy mummy, happy family! Would really like to have it as both my baby boy 11 months old and I have sinus problems. I strongly believe that your purifier can help me to alleviate the symptoms at the same time effectively reduce our sinus problems. I wanna win a Airclean 50 because my home can be quite dusty especially when there is non stop construction going on in the surrounding area. I stay on the lower floor and the population causes my home to get very dusty and our noses can be quite sensitive too, bad for our health. I believe the Airclean 50 is what I need in my home, purifying the air, having clean air and less bacteria is most important to me especially when I have small children, elderly parents and 2 dogs. I hope to win one Airclean for my 1year old daughter. We are just renting a room here in Singapore and I would want what's best for my baby. I am a first time mom too and it makes me over worried when my daughter gets sick. 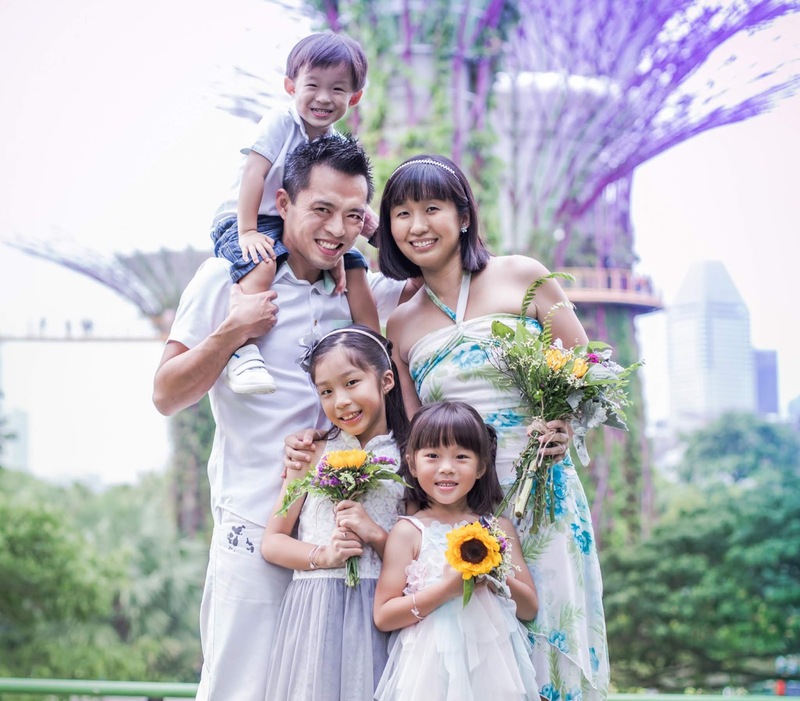 My husband also has a rhinitis so with the help of airclean i will less worry for my family. Thank you for your giveaway. God bless. My kids are very prone to getting sick, every now & then they get fever & flu & the virus spreads to us & my parents who are taking of them. I am sure with a airclear 50, we will get a much fresher & healthier air so that we won't fall sick so easily, the clinic & hospital bills are really expensive these days. Hope to win for our new house as my 2 kids have eczema. Would like to have a cleaner environment for them! Smart sensor and auto speed mode function to work according on air quality. it is so Quiet. Noise level as low .We Love it the design so much . I hope to win the airclear 50 for my children. My elder one has serious eczema, sensitive nose, eyes and lungs. Hope to have cleaner indoor air for them. Thank you for the giveaway. I love to own a airclear 50 cos I need a more improved quality of air esp when I have 3 cats and 3 children and 2 elderly parents at home. I strongly believe healthy air is the key to a healthy life, free from harmful pollution, bacteria and germs. I would love to win Purlife's AirClean 50 hoping to step up the air condition at home! Both me and my 5 year old have sensitives noses and we will be welcoming a new member very soon! It will definitely come in very handy with a newborn at home! Wanna win this for my sons' health. Their health is my upmost priority. My kids both have asthma, bad sinus and sensitive airways. I would hope to win this as it's helps to purify the air, removes contaminants from the air in a room. These devices are commonly marketed as being beneficial to allergy sufferers and asthmatics, and at reducing or eliminating second-hand tobacco smoke. My brother and I have sensitive nose since we were young, especially my brother who is prone to asthma attack. Having this would really be a benefit to my entire family to protect us from dust particles! Hope to win Purlife's AirClean 50 for my 3 month old baby boy and myself as I have eczema and our house in Punggol is full of on going constructions hence the air is very dusty. 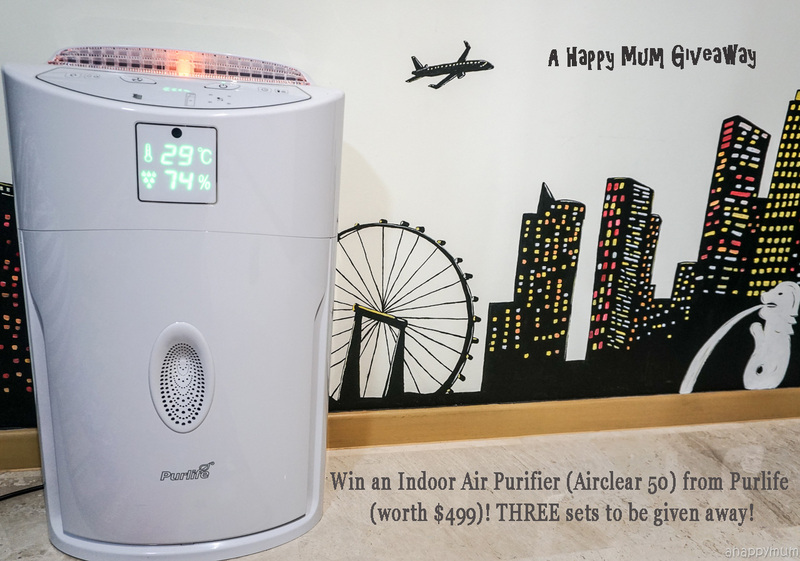 Hope to win this Purlife's AirClean 50 for my 3 kids! I have 3 kids, aged 5, 3 and 8mths! 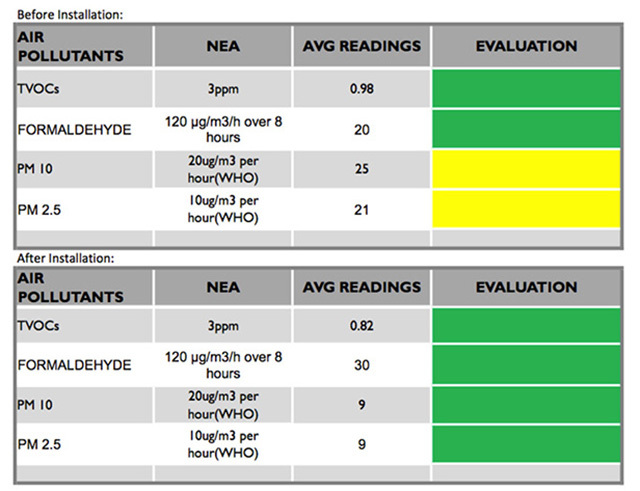 Hence clean air is very impt to me as the 2 elder kids are in child care and will fall sick quite often. With the Airclear 50 which has an extremely fine filtration, it is able traps tiny particles down to 0.3 microns in size. This will help to cleans the air effectively. Also, it is child-friendly which is very impt to me as my kids are very active and will be running around the house and they also like to press buttons! Hence, the child proof fuctions will be very useful to me. I wish to win this airclean 50 because it is using a 3M™ HEPA Filter* with pollutant removal rate of up to 99.97%! Moreover, it is cost-efficient( less than $3^ a month on electrical bills. )It purifies air within 15 minutes and has a smart sensor and auto speed mode function which will work according to the air quality.The noise level is low and the child lock plus family-friendly design makes it the perfect purifier for all consumers! Whole family has sinus and my daughter has asthma, really hope to win this and enjoy quality clean air like never before! I would like to win to have cleaner and purer air at home. I wish to win Purlife airclear 50 because I am an expectant mother in my last trimester and I have eczema with irritating and painful outbreaks. It means I'm very sensitive to dust particles, bacteria etc and this condition bothers me for the past 20 over years. Although there is no cure for eczema, I hope to win this Airclear 50 to help me reduce allergic reaction. Now that I'm pregnant, I would also appreciate that Airclear 50 will make my house allergen-free for my little baby due soon. 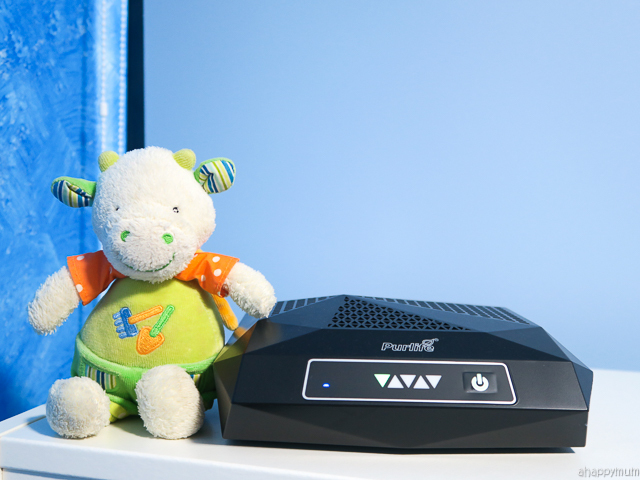 I like Purlife Airclear 50 that enables us to check the air quality readings and its child-friendly design that assures me that it will not topple over! As I'm currently into my last trimester and as a first-time mummy, I would definitely view baby's health and safety as main priority and hope to be the lucky winner to have Purlife Airclear 50 in my home so that my parenthood journey can be more smooth sailing as we further reduce the risk of respiratory illnesses and accidents! Prevention is better than cure. With the arrival of my baby, I pray that my baby won't have ezcema since we can take preventive measure with the help of the Airclean 50 that allows us to breathe in cleaner air! Good air quality is essential for good health and I hope Airclear 50 can benefit me and my baby. Good health = Happy Family! I need the air purifier!!!!! My area are under the Home Improvement Progress. Upgrading of toilets are going on in my unit this month end. During the upgrading, there sure be lot of dust . A air purifier is when I needed most. i wish to win this indoor air purifier Airclear 50 for my home. my parent , my kids we all stay under one roof. we stay in very low lever and currently there is an upgrading construction just beside my block which really make the area/air very dusty. had daily sweep clean wipe the house but always full of dust dun mention the Air . that I got to close up all window and turn on the air con. which will turn my electric bill high and also not very good to my sons skin . which had very dry and sensitive skin. With so much going on nowadays ( virus. air pollution in different ways and have no idea what new virus may come again ), it's good to have have some precaution and protection and it's good to start with an air purifier. It's probably the BEST thing you can gift to your dearest loved ones! Don't we all want the best for them only! I wish to win this because I hope that it will help for my eczema and the sensitive noses of my brother and I.
so that germs stay away from my 4 children. My newborn twins have been down with a flu bug since they r 3 months old. One was hospitalised. This purifier will really be useful for me. My kids and myself are having sinus problem. It is such a pain in my heart to see them suffering like me since young.